Direct response television is one of the most effective, cost-efficient ways to reach a large number of prospects, convince them of the value and benefits of your product or service and convert them into buyers. Over ten years, I have created over 300 TV commercials and videos, including 13 infomercials. Today, a range of brands and businesses sell their product or service with infomercials, from entrepreneurs with new innovations to large corporations with established products. Turn on your TV, and you will see competitive infomercials for insurance companies with Medicare, automobile manufactures and reverse mortgages. Knowing why, when and how to produce infomercials has brought million-dollar success stories to businesses. I believe infomercials will to continue to do so as media options expand. Increase sales. Infomercials sell products directly to consumers. Generate leads. Infomercials can be used to generate prospects. Send these prospects brochures, videos or product samples etc. that will generate direct sales or bring the prospect into their nearest retailer. Gain retail distribution. Products that might never see retail distribution are fast-tracked to the largest retailers once the infomercial hits. Relationship marketing. Once you have generated your leads and build a database, begin building a relationship with your prospects. For instance, send your prospects an unsolicited sample of your product to encourage a purchase. Continuity program. Once a consumer’s business is captured with an initial sale, subscription or club membership, keep your customers buying every month or quarter through installments in a series of catalog sales. Brand awareness. Infomercials can function in the same way traditional advertisements do, by helping to create brand identity and helping to develop brands. 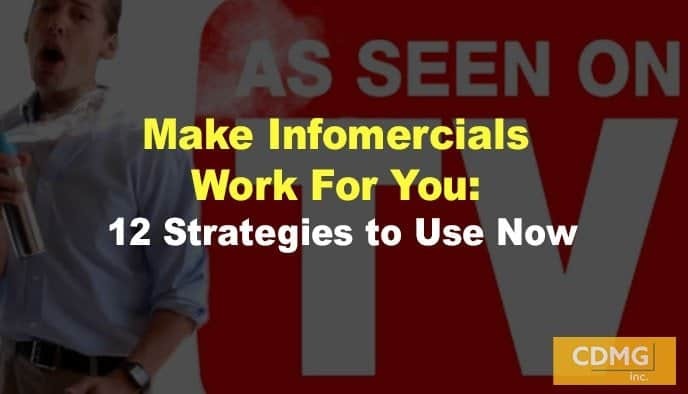 The success of your infomercial depends on how you use direct-response strategy to emphasize the benefits of your product to make a strong sale. Strategy #1: Consider your product. The products that work best in infomercials are those that are easily demonstrable. For example, cosmetics sell well through infomercials because the viewer can see them being applied and how attractive they make the wearer. Strategy #2: Educate your prospects. Research indicates the primary reason many prospects do not buy is that they do not have enough information to make an “educated” buying decision. Give your prospects enough information to educate them about products and services. Tests have proven that when there is a substantial amount of information to be communicated about a product or service, 30-minute infomercials work best. Strategy #3: Motivate the viewer to buy immediately. Emphasize urgency in your offer by giving prospects a bonus or discount if they buy within a certain time period. Strategy #4: Present information in an engaging, easy-to-grasp way. Use a mix of hard facts, expert advice, verification, personal appeal and the testimonials of satisfied customers. These elements should be combined through the visual impact of television to make your product or service seem irresistible. Strategy #5: Position yourself without being overtly commercial. You can use a professional “spokesperson” or celebrity host to guide viewers through your program, interview independent experts and key company personnel, interact with satisfied customers and provide transitions through scenes. Strategy #6: Repeat important claims about your product or service. Appropriate visual reinforcement should include the use of eye-catching graphics, video effects, stock documentary footage, still photos and dramatic re-creations. Strategy #7: Use the right music and sound effects. These elements are critical to further enhance key moments in the program and increase product value. Strategy #8: Design the entire infomercial to “sell” your product or service. Remember, your commercial is not entertainment; it’s an opportunity to drive up sales and make a profit. Use the principles of direct response marketing throughout your entire commercial. Strategy #9: Consider creating a series of commercials. Consider creating a series of 3-5 minute, hard-hitting commercials to drive up sales. Strategy #10: Emphasize important ordering information. Make it easy and clear for prospects to order by showing your URL, your 800 number and other important ordering information on-screen throughout the commercial segments and at other appropriate times throughout the program. Strategy #11: Be strategic with pricing. The price of products sold on infomercials is as varied as the products themselves, from $39.00 to over $100,000. However, most are in the $19.95 to $295 range. Many marketers have found their best results come when offering installments, such as four monthly installments at $39 each. Strategy #12: Make a powerful close. Last but not least important, include a warm summary and a strong call-to-action at the end of the infomercial. Remember, the point is for viewers to immediately respond to your offer once the commercial has ended. Finally, you’ll want to consider infomercial costs. Estimating production costs up front is difficult because the prices will depend on the specific elements included in your program. These elements will be determined during the creative phase of your project. After you have a “treatment” (a blueprint of your program) and a preliminary script, a production budget can be developed. This budget should be completed and approved by you before production begins. Typical costs for scripting and producing a 30-minute infomercial can range from $100,000-$250,000. This price still gives you an excellent direct response program that includes most, if not all, of the elements outlined above. Special set construction or production travel may also result in additional charges, as may celebrity talent. Is Television Right For You? Many of today’s most impressive business success stories include television because it is probably the best way to deliver product demonstrations with an emotional impact, get reaction from viewers via an 800 number and instantly gauge response. To see more details about how we create high-impact infomercials, click here. Find out how infomercials can fit into your marketing mix. Contact me at (310) 212-5727 or email Caleb at caleb@cdmginc.com.